Culture, art, types, customs, legends, objects, books, recipes and more... Welcome to the fascinating world of tea ! There are four things that can harm tea: air, light, moisture, or excessive heat. Therefore to best protect your tea, store it in an air-tight, lightproof container away from moisture or heat. The foil bags that loose tea comes in, when you buy it at a good Tea shop, are good temporary storage containers. 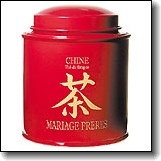 For longer term storage, the ideal container for Tea is the simple metal caddie with a narrow opening at the top (as illustrated). With very few exceptions (Pu-Erh being the most famous), Tea is not meant to age. It is best consumed within a year of purchase. The suggestion here is that it's best to buy your tea regularly in smaller quantities. Be careful about storing you teas with your spices. Dry Tea leaves are extremely absorbent and will absorb the aromas of anything in close proximity. Why is it recommended to store tea in airtight containers? Is it to prevent from moisture entering or for some other reason? Is air tight means moisture barriers? Why it is not recommended to store tea in the refrigerator? How to store the flavor granule/liquid added teas? These areas are vague areas, in which I need explanations. Please do the needful. Thank you.